A common technique to produce a unique sound from a classical guitar is capable of making a string vibrate on the second harmonic. 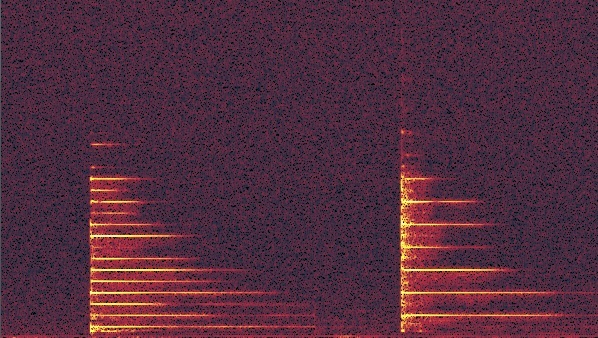 The differences between the first harmonic and second harmonic of the same string is analyzed on the spectrogram of the recorded sound bellow. 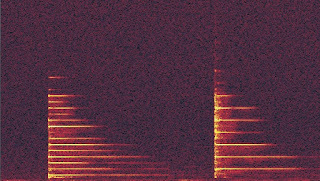 The spectrogram is a frequency(y-axis) per time (x-axis) graph colored according to intensity. First harmonic: 5614, 4974, 4654, 4305, 3956, 3636, 3316, 2967, 2647, 2327, 1978, 1658, 1338, 989, 669 and 320Hz. The second harmonic has small streaks between it's few long streaks. These small frequency lines which end after approximately 100 milliseconds are probably stopped from vibrating after the index finger of the player is removed from the string. This movement is part of the technique to create the second harmonic sound. It also seems that the second harmonic has a higher pitch in comparison to the first harmonic.